Mandalay surprised us...it was not like Mogok but there were a lot of rocks to see. Also visited a couple of mineral shops, but didn't find anything to buy. We still had a few important cultural sites to visit on our last day. First stop was the Royal Palace of Mandalay (with its intimidating warning sign). This palace was the last home of the Burmese royal family. King Thibaw and Queen Supayalat. They were exiled by the British to Ratnagiri, India. Thibaw died in India but the Queen and some of their daughters eventually returned to live in Burma, stripped of their royal titles. The palace was built in 1857 by King Mindon and then mostly destroyed by Japanese bombs during World War Two. Most of the buildings were made of wood and burned to the ground. Using the original architectural plans, the government rebuilt the complex in 1990. The two white buildings are the only original buildings left. Not far from the palace is a monastery that was built in the 1700s. This is one of the few old wooden structures remaining in Mandalay. They are at constant risk of fire damage. This building is maintained by students from the Buddhist school across the street. A close up of the elaborate carvings that decorate the walls of the monastery. 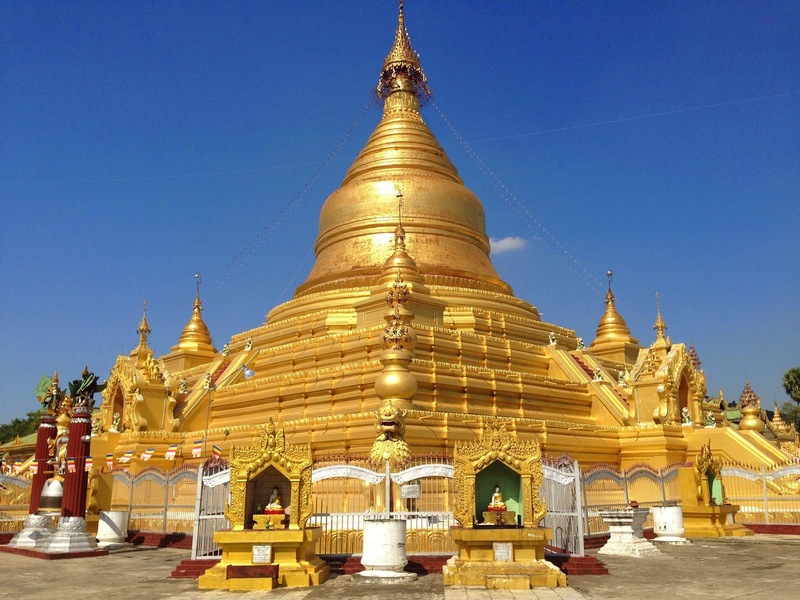 This is Kuthodaw Pagoda, which contains the world's largest book! The book has 1460 "pages" or stone tablets. There are 729 tablets each housed in a small stupa with a precious gem on the top. This is two pages (front and back) of Budhist scripture and all together they make the world's largest book. We saw this statue inside of one stupa. 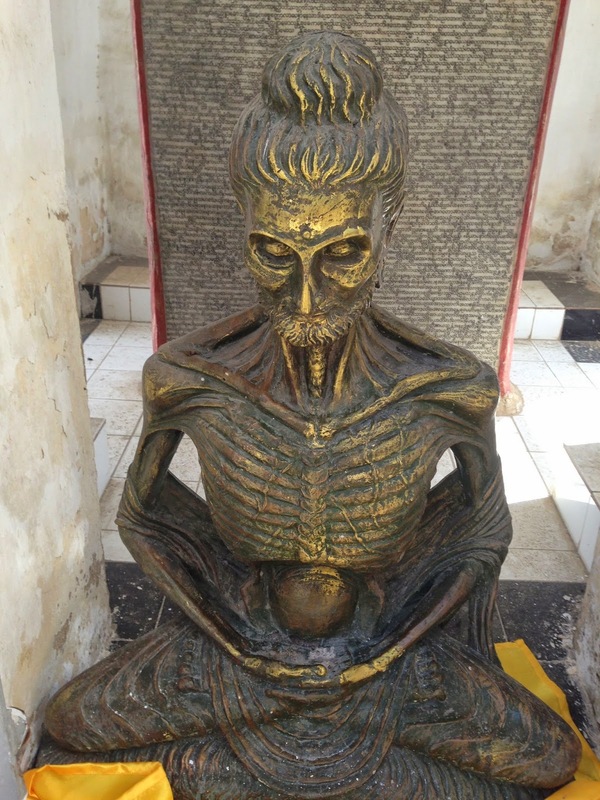 This is a "fasting Buddha". Approaching Mingun, you can see the massive ruins of the unfinished Mantalagyi Temple. It was built in 1790 by King Bodawpaya whose palace was Amurapura (just outside of Mandalay). If it had been finished, it would have been the largest temple in the world at nearly 500 feet tall. There are no cars in Mingun, this is one of the few options for transporation. Where are you going Edna? There isn't really much inside Mantalagyi Temple, people like to climb to the top despite the "no climbing" signs posted everywhere. The "No Climbing" signs are there for a good reason, earthquakes have severely damaged the structure. Walking a short distance along a dirt road we arrived at Hsinphyumae temple, on of the most beautiful buildings we saw in Myanmar! You come around a bend in the road and there it is in front of you, amazing. The design of this temple is based on Mount Meru, the mountain with five peaks that is at the center of the universe in Buddhist cosmology. King Bodawpaya also built one of the world's largest bells, the Mingun Bell. Anyone can ring the bell, or stand underneath it if they wish. Getting back on the boat. Notice that the the handrail is two men holding a pole. Cold beers on the boat to celebrate a lovely time in Mandalay. Exclusive and interesting post.. thanks for sharing . Keep updating it..